After having my own personal campus tour of Rice University from a tour guide who was serving as Vice President of one of the 11 residential colleges, and then lunch with two freshmen, I’m eager to share my feel for the student vibe at Rice. Rice’s housing system is quite unique: incoming first-year students are randomly assigned to a residential college, with which they remain affiliated for all four years. This is the first way that Rice makes a medium-sized research university (3700 undergraduates and 2200 grad students) more intimate and manageable in size. Each college has between 300-400 students, and most have somewhere around 100 first-year students. Freshmen almost always room with other freshmen, but students of all years live within the college. Most seniors want to live on campus their final year, and many juniors live in nearby apartments (but maintain their affiliation with their residential college). Students are ushered into Rice’s campus through the center of this main administration building (they call the tunnel a “sallyport”) during Orientation week, but superstition precludes them from walking back out to the street through this same tunnel until they graduate. 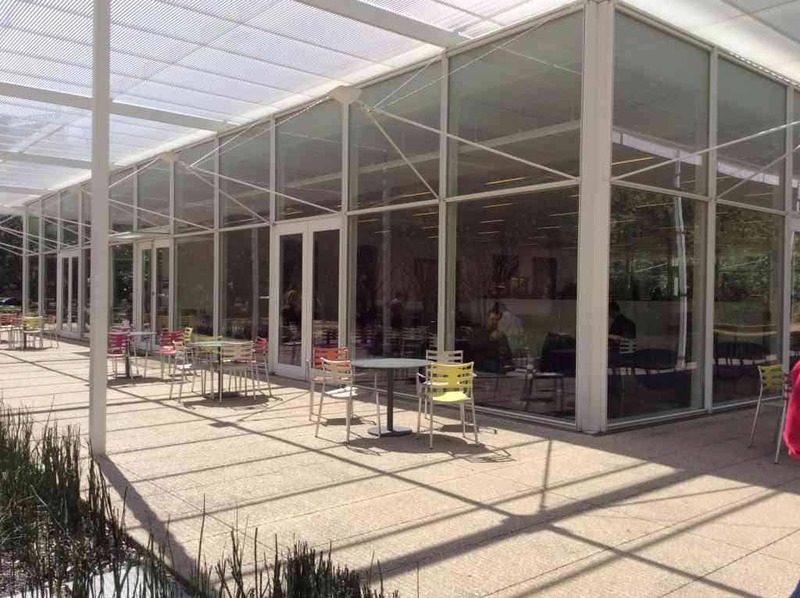 Each residential college has common areas and its own cafeteria, though students can eat at any of the cafeterias on campus with their student ID. There is only one meal plan with 19 meals per week. While most of the cafeterias are closed for Saturday dinner, there is a college town-like village just a few blocks away, with many restaurant and shopping options (if you visit, make sure to save time for The Original Chocolate Bar!). The colleges each have a student government structure, and each has faculty living within the dorm, as well as a resident “master” who plans events. Each college is given an annual budget, and each determines how it will decide how those funds are spent (some have representative democracies and some have direct voting). Each college also has its own judicial body, which hears problems that arise before they are passed along to the university-wide (student) Supreme Court, if needed. If you can’t tell from the above description, self-governance is an important theme at Rice, and this gives many students the opportunity to hold meaningful campus leadership roles. There are no fraternities or sororities at Rice, but the residential college system plays such an important role in students’ social life such that the lack of Greek life does not create a social vacuum. Academics at Rice are strong and collaborative. Students study together in groups with others in their class, as well as others in their residential college. Upperclass advisors, who are selected within each college, organize study sessions and mentor underclass students. Faculty advisors are not assigned; rather, Rice students must seek out this type of guidance. But during the mandatory one-week orientation, faculty members from each of the academic schools (there are 6) spend time with new students in each college, encouraging them to visit professors during office hours and outside of class. All of the students I spoke with told me their professors were very accessible. The academic programs available are listed here. About 55% of Rice students are from outside of Texas; about 10% of the students are Jewish. Houston’s Hillel serves Rice and University of Houston students, as well as several smaller schools in the area. The Hillel house, about a 10 minute walk from Rice, hosts three Wednesday lunches each month. 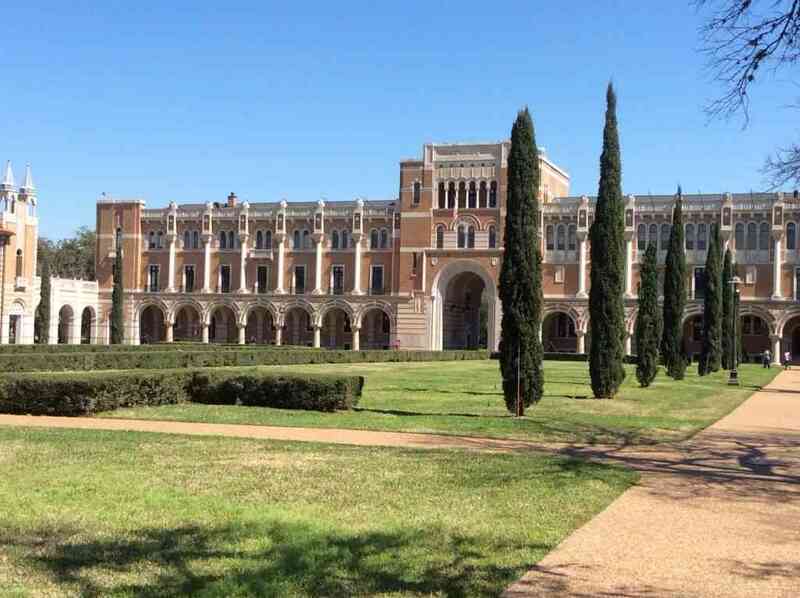 Rice was founded in 1912 and is a highly-respected, highly-selective institution. They offer high school seniors the opportunity to spend the night on campus for an up-close look at the school. Students considering Ivy League and other top-tier colleges would be well-served to take a look at this very close-knit community of smart students in Houston – where they can get the strong academics without the east coast’s cold weather. Rice is tied with Notre Dame for the #18 national rank, just below Vanderbilt and just above the #20 tie of Emory/Georgetown/UC Berkeley. Rice has a large campus full of gravel walkways and a mixture of modern and original buildings that all blend together well. Click here to read Rice’s viewbook. You can see my photos here. Admissions stats: Mid-50% SAT Critical Reading 650-750; Math 680-780; Writing 650-760.